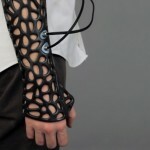 It looks like something from the Borg (read, cool), but it’s actually a cast for healing bones. The Osteoid, created by Turkish student Deniz Karasahin, incorporates 3D printing and ultrasonic tech to make healing a broken bone more bearable. The idea of ultrasonic healing vibrations to heal bones (and other wounds) has been around for a while. But the problem was doctors couldn’t get past the plaster cast to apply the vibrational therapy. Take a look at the pic below and you’ll see the Osteoid’s skeletal design allows ultrasonic drivers to be placed directly on the skin. The Osteoid is just a prototype at the moment. However, future production will enable each individual to have a custom-fitted cast. For single 20 minute daily sessions this system promises to reduce the healing process up to 38% and increase the heal rate up to 80% in non-union fractures. The only downside is you won’t be able to get your friends to sign it anymore. Posted in Medical. Bookmark the permalink.